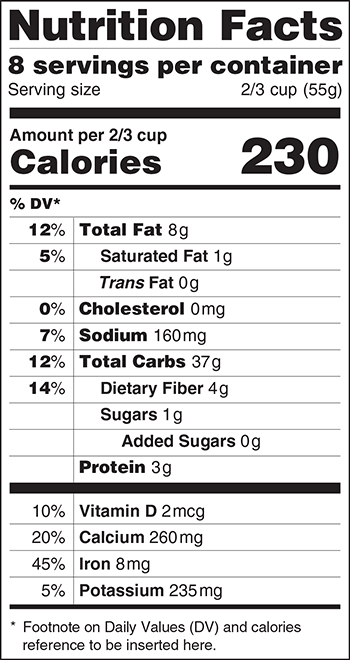 Did you hear the news about the proposed new food label back in February? Basically, the government has decided that the current food label isn't helping American's make healthy food choices. So, they want to change the layout, information provided, and the serving sizes listed on the food labels. 1. It tells about added sugars. Some foods have natural sugar (milk, for example). Some foods have added sugars (chocolate milk, for example). By having a line for added sugars, it lets consumers know what's supposed to be in the food and what's been added. 2. Serving Sizes: Ahhhhh.....Serving Sizes. The current food labels have two problems: first, the serving sizes listed are way too small for what people actually consume so the nutritional information is wrong, and second, the number of servings per container is super small. 3. The new emphasis on calories and servings per container is very helpful. I hope that people take time to learn about the new label and what it means for their food choices. Of course, my goal is to get families to eating foods that don't have labels....but baby steps!